Charles Lane of The Washington Post has a recent column entitled, “Why Less Home Ownership is Actually Good News.” The important issue he raises is how home “ownership” is defined, whether in terms of the percent of households having bought homes, currently down, or in the amount of equity they have in their homes, currently up. 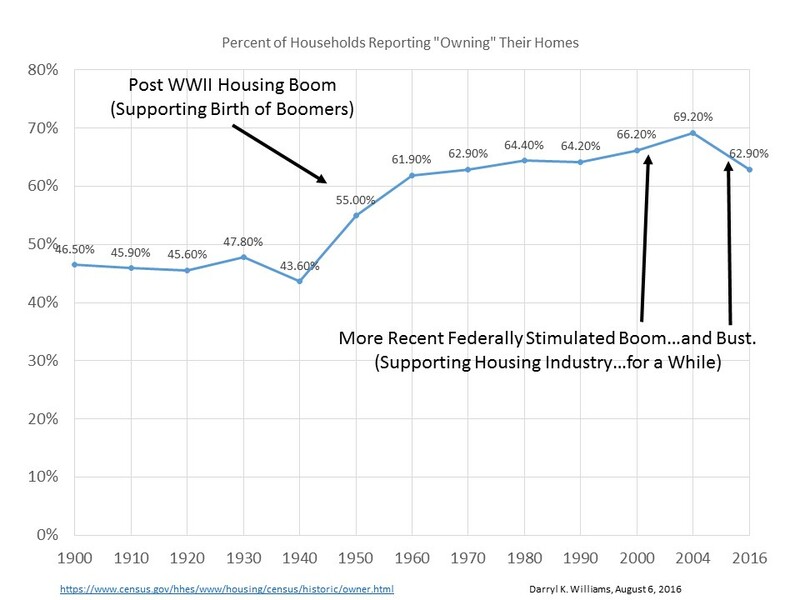 He points out that home ownership as determined by percent of US households “owning” their homes peaked at 69.2% in the fourth quarter of 2004 but, as of the second quarter of 2016, has dropped to only 62.9%, a level last seen in 1965. Average equity per homeowner, however, has increased because there are fewer underwater mortgages. The first chart below covers a longer period of time while the second gives more detail for the latter years. 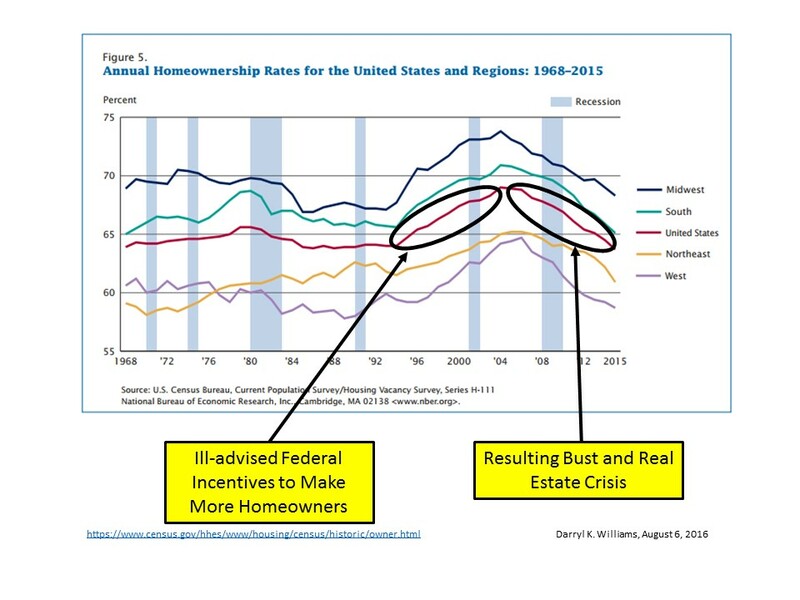 As Lane points out, federally backed low or no money down mortgages such as were promoted heavily during the Clinton and Bush administrations are not viable routes to home ownership. They are traps that encourage people to buy homes very unlikely to increase in value and to take on responsibilities they are unprepared to handle. 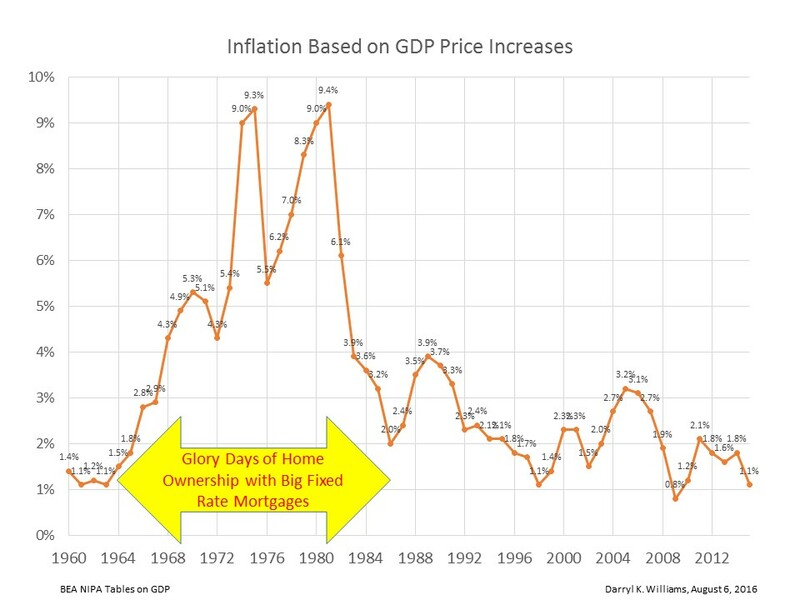 Housing down payments of 20% or so were still the standard in 1974 and are wise today. Nothing good can happen from helping someone who has been unable to save a reasonable down payment buy a home with a 100% mortgage. What will be the source of the 1% to 4% of the home value required annually just for routine maintenance? And, to compound the problem, when the federal government made home buying so easy, builders rushed in with large developments of low priced homes to entice potential buyers. Values dropped, homes deteriorated, vacancies increased, borrowers defaulted, and we had the predictable bust which wrecked our economy eight years ago. So, if you want to make a home, buy a house you love or can learn to love, make a good down payment, and take good care of the property. It will pay big dividends though perhaps not financial dividends. You can even hope for a little increase in inflation to shrink the mortgage payment and drive up the eventual selling price. Unfortunately that inflation will not help our national debt much since the interest rate on it is variable. Plenty to think about. We are on home number four. group? You could handle it. I am on house #2 with my spouse. We have lived in our modest (1750 sq ft) home for almost 30 years, 20 years with no mortgage. Not buying a bigger or more expensive home helps us share, travel, and make small investments (stocks).